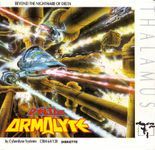 Armalyte is Thalamus' sixth game for the Commodore 64, released in November 1988, and is a horisontal space shoot'em-up (shmup) developed by the team Cyberdyne Systems. For its time, Armalyte was groundbreaking with colourful graphics, impressive amount of power-up possibilities for the ships, a super weapon system with three types to choose from, and co-operative play, where two players could cooperate to defeat the game. It is generally considered as one of the best shoot'em-ups for the Commodore 64. The title music is written by Martin Walker.